Insect Season is Upon Us! Upon wandering through the garden this morning (if by “wandering” you mean watering), I discovered that the warm/hot temperatures of the last several days have caused numerous batches of insects to hatch out. There are quite a number of tiny grasshoppers roaming around. On a positive note, there are a lot of ladybugs too! I hoope they are eating their fill of aphids. The two insects I found that are currently the most destructive are the ones eating the cabbage, cauliflower, and Brussels sprouts and the ones eating the currant leaves! 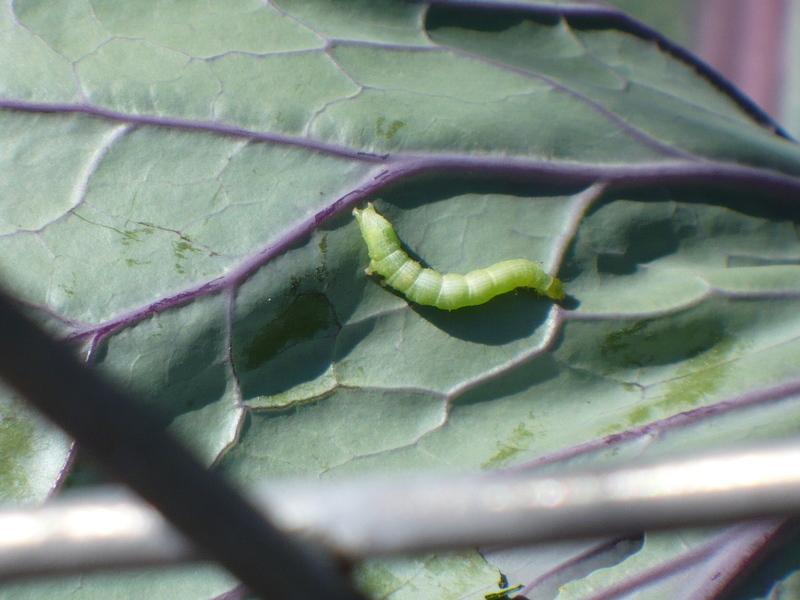 This little guy (and a bunch of his friends) are munching holes in the cabbage leaves especially, but they are also starting in on the cauliflower and Brussels sprouts. I’m almost positive that this is an Imported Cabbageworm, a type of caterpillar that turns into the white moths you frequently see flying around the Brassica vegetables. The way to treat these critters is with a dusting or spraying of a Bt product. (Bt is Bacillus thuringiensis, a bacteria that kills the caterpillars after they ingest it.) Happily, Bt is an organic product. These insects are eating away quite happily on the currant bushes. 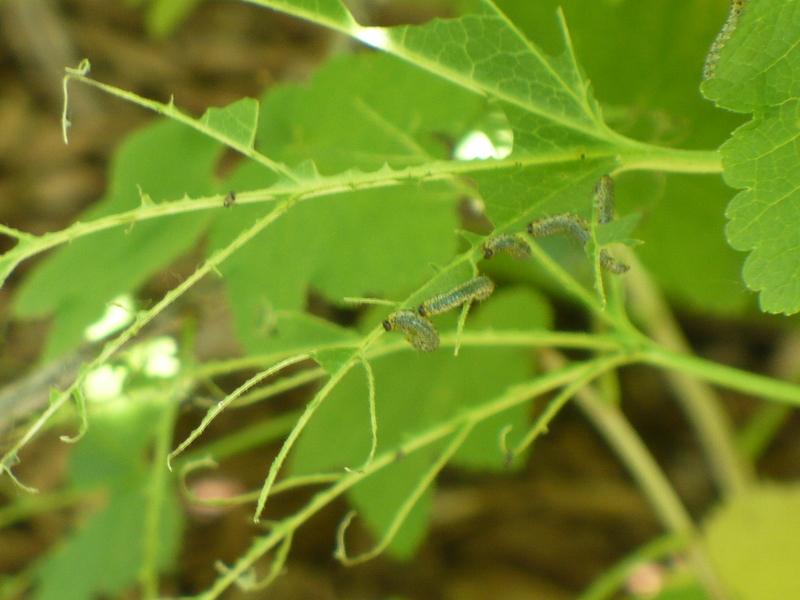 I’m not sure what they are, but from doing a little research, it looks like they may be an insect known as Currant Sawfly (or Imported Currantworm). If that is the case, these are not actually caterpillars, and as such cannot be killed with Bt. Rats! Apparently pyrethrins, insecticidal soaps, and handpicking the larvae are the control options. The fruit are starting to ripen, so we want to be careful with what we use. Posted on June 1, 2009, in Family of 4 Garden, Insects Abound! and tagged cabbage, cauliflower, fruit, insect problems, vegetables. Bookmark the permalink. Leave a comment.